Domaine Pontifical dates back to the 1920’s, but it took until 1979 for the modern era for property to start becoming established as a winery. In 1979, Francois Laget and Isabelle Laget started to manage the estate, renaming it Domaine Pontifical. The cellars are even older than the property as they date all the way back to the late 1800’s. Domaine Pontifical owns 17 hectares of vines in Chateauneuf du Pape. 16 hectares are planted with red wine grapes. 1 hectare is reserved for the production of white wine grapes. The Laget family also own 2 hectares of vines with classification of IGP. Domaine Pontifical produces 2 red Chateauneuf du Pape wines and 1 white Chateauneuf du Pape wine. Most of the vineyards are located in various lieux dits placed in the western portion of the Southern Rhone appellation. Domaine Pontifical Chateauneuf du Pape is produced from a blend of 75% Grenache, 10% Syrah, 5% Mourvedre, 5% Counoise and 5% Cinsault. On average, the vines are 40 years of age. 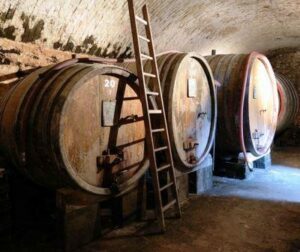 the wine is aged in old foudres for 12 months. The production is on average, 5,000 cases per vintage. Domaine Pontifical Les Vieilles Vignes d’Albert is produced from 90% Grenache and 10% Syrah.The wine is aged in a combination of new and used French oak barrels for 12 to 14 months. The wine takes its name the founder of the estate in the 1920’s, the great grandfather of Francois Laget. The wine made its debut with the 2007 vintage. Domaine Pontifical Chateauneuf du Pape Blanc is made from 60% Grenache Blanc, 20% Roussanne, 10% Clairette and 10% Bourboulenc. The wine is aged in a combination of vats and French oak barrels for 6 months. Domaine Pontifical can be enjoyed on the young side. Young vintages can be popped and poured, or decanted for about 1 hour or less. This allows the wine to soften and open its perfume. Older vintages might need very little decanting, just enough to remove the sediment. Chateau Beauchene is usually better with 1-3 years of bottle age. Of course that can vary slightly, depending on the vintage. In the best vintages the wine should be consumed within 2-8 years after the vintage. Domaine Pontifical is best served at 15.5 degrees Celsius, 60 degrees Fahrenheit. The cool, almost cellar temperature gives the wine more freshness and lift. Domaine Pontifical is best served with all types of classic meat dishes, veal, pork, beef, lamb, duck, game, roast chicken, roasted, braised, stewed dishes, sausage, barbecue and cassoulet. Domaine Pontifical is also good with Asian dishes, hearty fish courses like tuna, mushrooms, cheese, pasta, eggplant and tomatoes. The white wine of Domaine Pontifical is best served with a myriad of different seafood dishes, shellfish, crab, lobster, sushi, sashimi, chicken, pork and veal, as well as Asian cuisine. Medium bodied, elegant, soft, and forward, this cherry filled charmer is for early drinking. From a blend of 80% Grenache, 5% Syrah, 5% Mourvedre, 5% Cinsault and 5% Counoise, the wine reached 14.5% alcohol. With a nose of Kirsch, fennel and ripe, sweet raspberries, the wine moved quickly to its smooth, open, forward, red berry finish. Light in the nose, the wine serves up delicate, tart, fresh red plums in the spicy finish. Light on color and on the palate, with garrigue, barnyard, some red fruits and a touch of brett. Light in color and fruit, the wine is a bit simple, with nice notes of fresh cherries and a bit of spice. Soft and easy drinking, this requires consumption. Fully mature, this medium/full bodied, spicy, soft, fresh, sweet, red berry filled wine is at peak, finishing with a fresh, peppery, kirsch note at the end.